This is where London’s gentry live. Nannies push prams around Kensington Gardens, uniformed school children line up in Hans Crescent and the social “in-crowd” gossip in the Fifth-Floor Café at Harvey Nichols. Whatever time of year, nobody is without a tan. 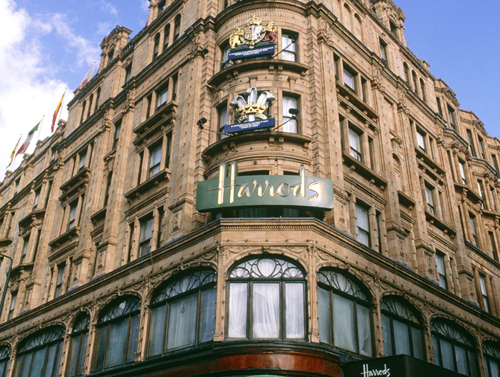 Harrods is the light beacon of the area; the solid rocks are the great museums established in South Kensington by Prince Albert, whose name is never far away. 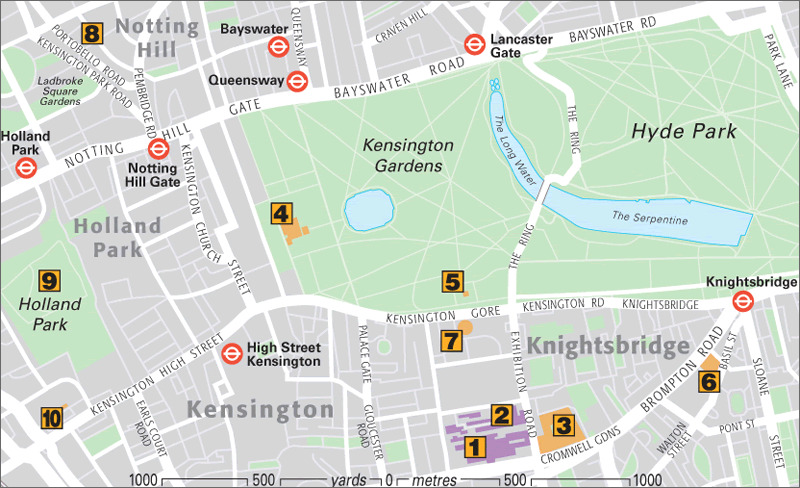 Kensington is the Royal Borough where Lady Diana roamed. 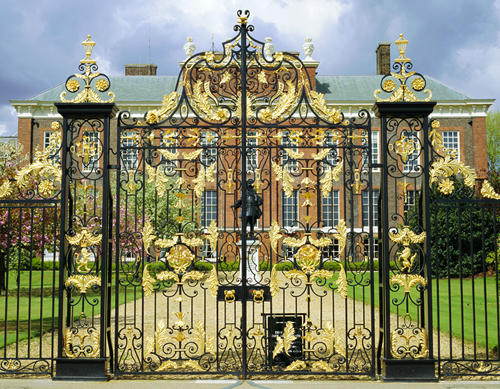 She lived in Kensington Palace, the choicest of royal residences, and shopped in Beauchamp Place. Foreign royalty have homes here, too. Such mansions need the finest furnishings and some of London’s best antique shops are in Kensington Church Street and Portobello Road, the most fun place to be on Saturday mornings. Queen Victoria and her first cousin Prince Albert of Saxe-Coburg-Gotha were both 20 when they married in 1840. 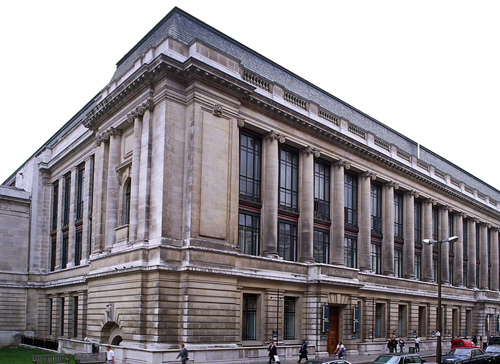 A Victorian in every sense, his interest in the arts and sciences led to the founding of the great institutions of South Kensington. He died at the age of 41, and the Queen mourned him for the rest of her life. They had nine children. The whole world of animals and minerals is vividly explained . Traces the history of scientific and technical innovation. 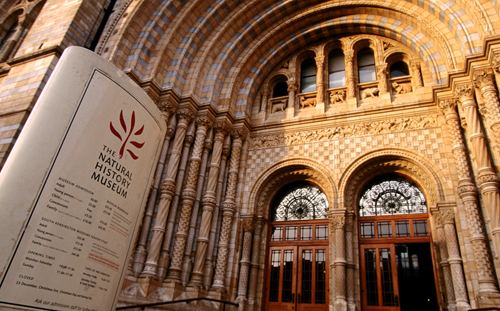 A cornucopia of treasures is housed in this enchanting museum named after the devoted royal couple. There are fine and applied arts from all over the world, from ancient China to contemporary Britain. 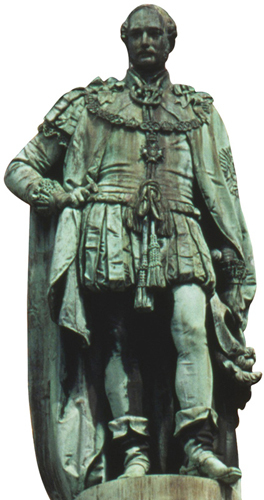 Highlights include extraordinary plaster copies of statues, and monuments and artifacts from the Italian Renaissance. Displays are arranged over six floors of galleries. The stunning British Galleries display more than 3,000 objects illustrating the best of British art and design since 1500. . This is a delightful royal residence on a domestic scale, still in use by members of the royal family: Diana, Princess of Wales lived here as did Princess Margaret, the Queen’s sister. The first-floor state apartments, built by Sir Christopher Wren for King William III and Queen Mary, are open to the public, and the audio guide (free) evokes 17th to 18th-century court life. Rooms on the ground floor have a collection of royal costumes, including those belonging to Queen Elizabeth II and also a beautiful collection of gowns that belonged to Princess Diana . This edifice to Queen Victoria’s beloved consort, Prince Albert, now glowing from a recent restoration, is a fitting tribute to the man who played a large part in establishing the South Kensington museums. 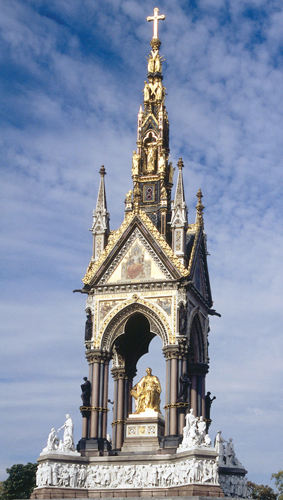 Located opposite the Royal Albert Hall, the memorial was designed by Sir George Gilbert Scott and completed in 1876. At its four corners are tableaux representing the Empire, which was at its height during Victoria’s reign. No backpacks, no torn jeans… Harrods’ doormen ensure even the people in the store are in the best possible taste. This world-famous emporium began life in 1849 as a small, impeccable grocer’s, and the present terracotta building was built in 1905. It is most striking at night, when it is illuminated by 11,500 lights. It has more than 300 departments and on no account should you miss the wonderfully tiled and decorated food halls. Pick up a floor plan as you go in. An Egyptian theme decorates the central well, at the bottom of which is a shrine to Diana, Princess of Wales and Dodi Al Fayed . 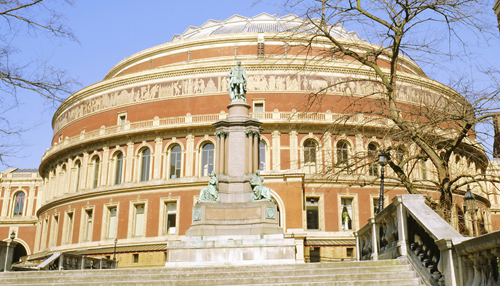 When Queen Victoria laid the foundation stone for The Hall of Arts and Sciences, to everyone’s astonishment she put the words Royal Albert before its name, and today it is usually just referred to as the Albert Hall. It is a huge, nearly circular building, modelled on Roman amphitheatres, and seats 5,000. Circuses, film premieres and all manner of musical entertainments are held here, notably the Sir Henry Wood Promenade Concerts . 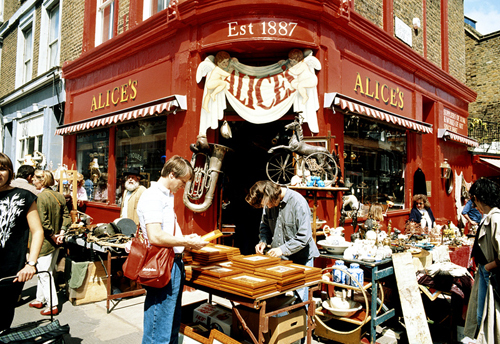 Running through the centre of the decidedly fashionable Notting Hill, Portobello Road, with its extensive selection of antique shops, is a great place to spend some time. It is especially good on Saturday when the market is in full swing. This starts just beyond Westbourne Grove, with fruit and vegetables, bread, sausages, cheeses, then music, clothes and bric-à-brac. Beyond the railway bridge it becomes a flea market. Sit upstairs in the Café Grove (No. 253a) and watch it all go by, or quench your thirst in Fluid’s juice bar (13 Elgin Crescent). Ethnic food is otherwise what goes down best, and the West Indian flavour spills over into the vibrant music and colourful clothes stalls . There is a great deal of charm about Holland Park, where enclosed gardens are laid out like rooms in an open-air house. 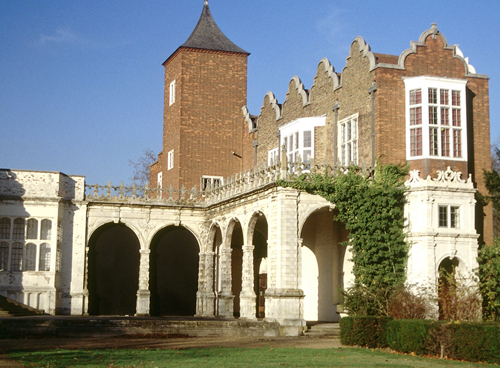 At its centre is Holland House, a beautiful Jacobean mansion, which was destroyed in a bombing raid in 1941. What remains is used as a youth hostel and the backdrop for summer concerts. Peacocks roam in the woods and in the gardens, including the Dutch Garden, where dahlias were first planted in England. All the themes of the Victorian Aesthetic movement can be found in Leighton House. It was designed by Lord Leighton and his friend George Aitchison in the 1860s. Its high point is the fabulous Arab Hall, with a fountain and stained-glass cupola. 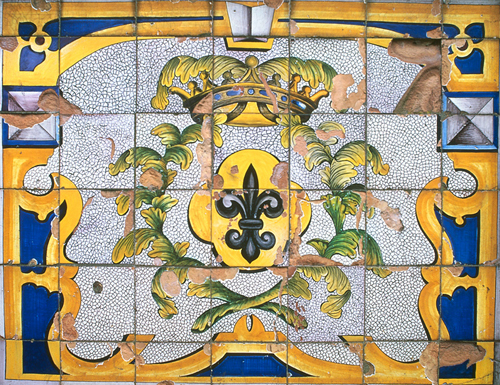 Other friends contributed friezes and mosaics, but many features are original, notably the Islamic tiles, collected by Leighton and his friends on their travels.